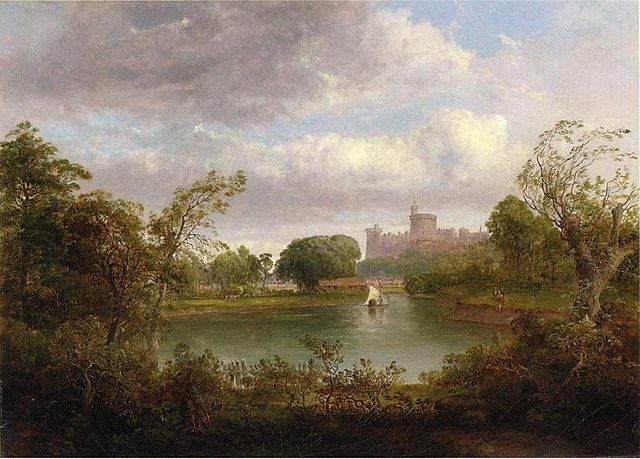 Windsor Castle is an exquisite monarchical supremity, a zombie of 2nd millennial architecture that remains standing not only as a museum of the past, but as a primary royal residence. Even the most modern additions to the structure refuse to shed history. They are a conservative, grandiloquent combination of Georgian and Victorian design, adhered to what is still a resolutely Norman design. It is as necessarily modern as the few Gothic flourishes allow it to be, but - stubbornly - no more than that. It was architect Sir William Whitfield, 20th Century champion of load-bearing permanence and monumentality, who famously criticized the castle's repeated attempts at contemporary interpretations of outdated fashions as possessing 'a certain fictive quality', pointing to the self-conscious attempts at replicating Gothic and Picturesque styles as a willful attempt to put on a 'theatrical performance'. But how better to sum up the Royal Family than that? The whole point of the Norman establishment of serfdom, centred around an ivory tower in which the local authority lived, was the visible separation of Lord and courtiers. The English class system which still persists today stems from the ordered, hierarchical bureaucracy set up by the Norman invaders. Central to this system of government were the impressive castles, many of which still stand across the country today as a lasting testament to the impact of 1066. Windsor Castle was among the very first, built in the immediate aftermath of William the Conqueror's invasion. The structure, strategically placed on an important stretch of the Thames, was just one of a ring of motte and bailey castles around the capital, intended to uphold Norman dominance on the fringes of the city. It was also next to Windsor Forest, previously used by Saxon kings for hunting. Windsor Castle's position was a very clear assertion of power over those who had ruled before. The castle continued to grow in importance, eventually becoming a favourite royal residence after Henry I took to using it. The motte and bailey structures were gradually replaced by stone fortifications, which protected the castle during the First Barons' War of the 13th Century, and further additions to accommodate the demands of kings. Further expansion was initiated by Edward III, who began turning the castle into a palace which rivaled the most magnificent in Europe. Following the Civil War, in which the castle survived surprisingly unscathed, Charles II created a series of extravagant, Baroque interiors - a real highlight for modern day visitors. George's IV and V renovated Charles' palace, in exactly the lavish Georgian style you imagine they would. And then there was a fallow period for Windsor Castle. As regal decadence went out of fashion in favour of quiet, dutiful modesty, the already-bloated castle was maintained, but not glorified. It was never the most fashionable destination for ordinary Britons, but with the Queen back on everyone's playlist for her Diamond Jubilee, is it time to reappraise this dinosaur of a building? Don't know about you, but we'd drag our hems over a mile of broken glass, and doff our caps til we dropped to see a glimpse of a living fossil like this, still the largest and oldest occupied palace in the world. Are you looking for a hotel near Windsor this autumn? Consider a stay at the Holiday Inn London-Heathrow M4, Jct.4 hotel for a convenient, great value accommodation option.